Boxers or Briefs? – Tell my story. Come on. I’ll bet you’ve wondered this about Emmett, too. There’s an well written, interesting site called Vintage Skivvies, which gives you the low down on what was typical underwear back in Emmett’s day. 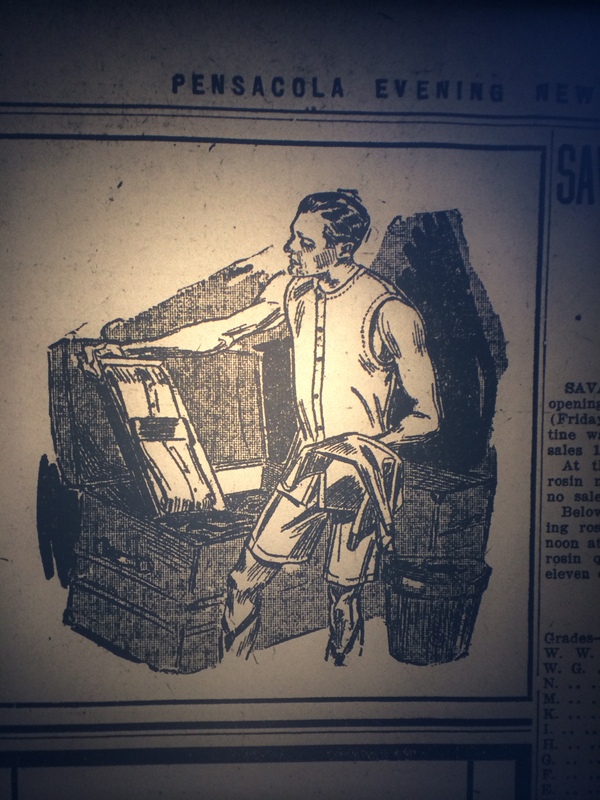 You can learn all about the history of men’s underwear, if you want! Very likely, our guy wore something akin to either the two-piece model, the undershirt with longish boxers; the boxers had a high-waist button waistband. No quick elastics in 1909. Also, there were man-sized onesies, union suits, which were common even during summer months. The two-piece woven underwear models (pictured above) weren’t common until after 1910. A man’s underwear was a serious garment. Source: Vintage Skivvies and Hampton’s Magazine. BVDs for any occasion. Source: Vintage Skivvies and Hampton’s Magazine. This example from Hampton’s Magazine for Gotham underwear just surprised me. Note the gartered socks! Of course. Emmett wore garters to hold up his socks (they also called them ‘hose’). I just hadn’t really thought about that. I’m sure Emmett had a union suit or three in his stash, especially during his stint in Sterling, Illinois from January-May, 1905. Imagine wearing a union suit in the summertime in Florida, though, underneath a wool business suit. Yikes! Men’s summer suits were of lightweight materials, most of them were of serge, flannel, even lightweight wool. Add the long underwear — even if it was knit or lightweight — and you are talking about a lot of fabric to schlep about on a body. These were the days before air conditioning. Emmett’s office was on the 7th floor of the American National Bank Building; you know it got hot up there during the summer, even with an oscillating fan. A serge suit at the beach. 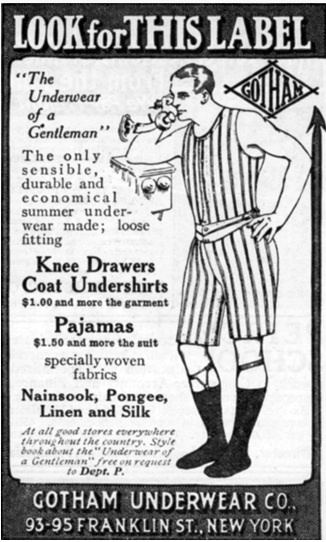 A sack suit was common for men’s wear in the 1910s. Swimsuits were made of wool, by the way. Wonder what kind of undies this guy is sporting? Source: Vintage Victorian. Dare we consider if Emmett went commando on the hottest days? Nah. That would be undignified, even though his sack suit coat would have covered up any, er, visuals. I don’t really see Emmett doing the commando thing. But I wouldn’t have blamed him.